Los Angeles, CA – Armenian youth from all over Southern California gathered at the ANC-WR headquarters in Glendale, CA to participate in the ANC-WR monthly educational workshop. This month’s workshop was presented by Glendale City Clerk, Ardashes Kassakhian. The workshop was comprised of various topics, such as the importance of Armenian involvement in their local communities and Armenian activism in the 2008 presidential race. The attendees were exposed to a straightforward learning environment from an educated and experienced professional. They also participated in a round-table discussion to solidify the information they had just learned. The workshop ambiance fully encouraged the attendees to take a proactive role in their local communities, and to take a stronger interest in politics. SANTA ANA, CA – The Armenian Youth Federation Orange County, “Ashod Yergat” Chapter hosted a lecture on Kurdish issues featuring the director of the American Kurdish Information Network (AKIN) and Kurdish-American activist Kani Xulam at the Orange County Armenian Center on Sunday, March 9, 2008. The lecture was comprised of three passages from talks given by Xulam in the United States Congress, Johns Hopkins University, and the Naples Council of World affairs, followed by a question and answer segment with the audience. Mr. Xulam’s lecture encompassed the current situation of Kurds in Turkey and the Middle East, the Kurdish peoples’ struggle to survive, as well as Kurdish-Armenian issues. I have never been to France, but Viken Berberian’s second novel Das Kapital: A Novel of Love + Money Markets made me feel like I was strolling through the south side of the French coast. From the towering skyscrapers of New York City to the serene beaches of Marseilles and Corsica, Berberian takes the reader on an exciting tale of financial markets and relationships with a uniquely exquisite poetic style. With his past experience within the finance industry in Paris, Marseille, and Manhattan, Berberian has first hand knowledge of the inner workings of financial markets. It is with this knowledge that Berberian created the main character of the novel, Wayne. Wayne is a successful stock trader on Wall Street, who makes a living by shorting stocks (profiting from shares losing value). In layman’s terms, Wayne profits from disaster and chaos. As he himself explains in the book, “Revolution, recession, devaluation, bankruptcy, war, genocide, earthquake, natural and man-made disaster, coup d’etat, nuclear meltdown; anything that might send a country into the scrap heap of history. You name it, we’ll trade it.” As a veteran stock trader, Wayne has a knack for predicting falling markets. To further his stock shorting operation, Wayne even goes as far as hiring a Corsican militant associate—a militant who, interestingly, crosses paths with a love interest of his. Das Kapital is an interesting novel with a unique view of present day financial markets. Having worked in the three main cities where the novel takes place, Berberian’s personal accounts help him paint a vivid picture of the setting. A homage to Marx’s original Das Kapital, Berberian portrays the worlds of finance, capitalism, and love with a fresh and unusual perspective. I would often think about the state of the world and economy while reading his book. Although, at times, certain parts were a bit wordy, I would recommend this novel for anyone interested in a different view of capitalism than that commonly presented in the American media and textbooks. When our organization established itself in the Diaspora and set itself out to struggle against apathy and assimilation among Armenian youth, it did so with the expectation that we would eventually gain the opportunity to return to a free, independent, and united Armenia. Maintaining the Diaspora and Armenian identity outside of the homeland has always been carried out with an eye toward one-day returning to the lands we were ripped away from. Today, we live in a historic era where Armenia is once again an independent state. We must realize that the torch has been passed to us to strengthen and enhance the Armenian Republic. Just as the fedayees of yesteryear flocked to Armenia and sacrificed themselves for the yergir, one of the main tasks of this generation is to commit itself to the development, democratization, and defense of Armenia. Ideally, this would entail going directly there and fully joining our compatriots in the struggle for Armenia’s betterment. There are hopeful signs that this process of repatriation to Armenia is slowly picking up steam. According to Armenia’s migration agency, the country has steadily registered a positive migration balance since 2004, with the number of people coming to Armenia exceeding the number leaving by 21,500 in 2006. We also see that young people from around the world have been visiting Armenia in greater numbers over recent years. Some are even deciding to permanently settle there. A growing economy and warmer relations with the Diaspora seem to be the main driving forces behind these developments. By serving as a bridge for youth wanting to travel directly to Armenia and Artsakh, programs such as Youth Corps also play a crucial role in this overall process. However, the work being done on the Genocide recognition front should also be seen in light of our commitment to strengthening Armenia. A denialist and unrepentant Turkey poses a lethal threat to the security and rights of the Armenian Republic. It is in the mutual interest of both Armenia and the Diaspora to have Turkey face up to its past and own up to its crimes. 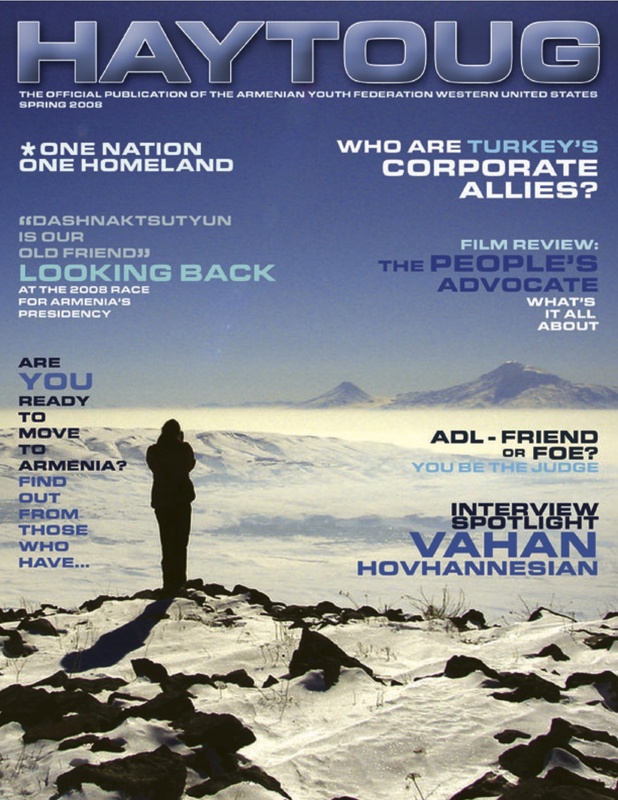 This mutual interest has been clearly manifested in everything from the mass demonstrations in Yerevan on the 50th anniversary of the Armenian Genocide to the more recent jubilation in Armenia over the US House Foreign Affairs Committee’s passage of H.Res.106 (the Armenian Genocide Resolution). In all of these endeavors, we must utilize opportunities to solidify our bonds with the homeland and promote the concept of Tebi Yergir. It is of utmost importance that we understand the value of this powerful concept and do all in our power to strengthen Armenia’s vitality.